But for an exception, the scene takes place in the open air and there are always many spectators. Paralytics cannot move. The one at Capharnaum is brought in by his friends through the roof of the house for the crowd is so numerous that they block the entrances. The one at the pool of Jerusalem stays in the middle of the other cripples for he cannot go and take the purifying bath alone. Jesus speaks to them and they are his words that perform the miracle. The words are represented by gestures and an exchange of gazes. But in order to underline the miracle, one can also show the paralytic go away with his bed under his arm. The blind move about with sticks and start up a dialogue with Jesus. He heals them by touching their eyes or even by putting a sort of plaster made of mud and saliva. This time, the gesture is easy to understand but one can also underline the recovery by showing the former blind man going and throwing away his stick. The same scene can be found with the healing of a deaf-mute. 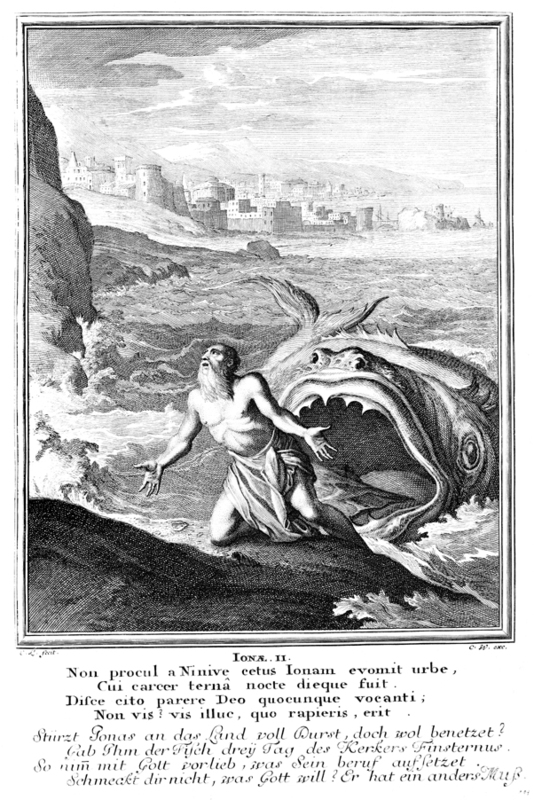 This form of healing also exists in the Old Testament: Tobias covers the eyes of his blind father with the gall of the fish and he recovers his eyesight. Other sick persons are seldom represented. Lepers are easy to recognize and Jesus simply speaks to them. Persons possessed make big gestures of madness, Jesus does not speak to the sick man but to the demon that can be seen coming out of the sick person and running away. 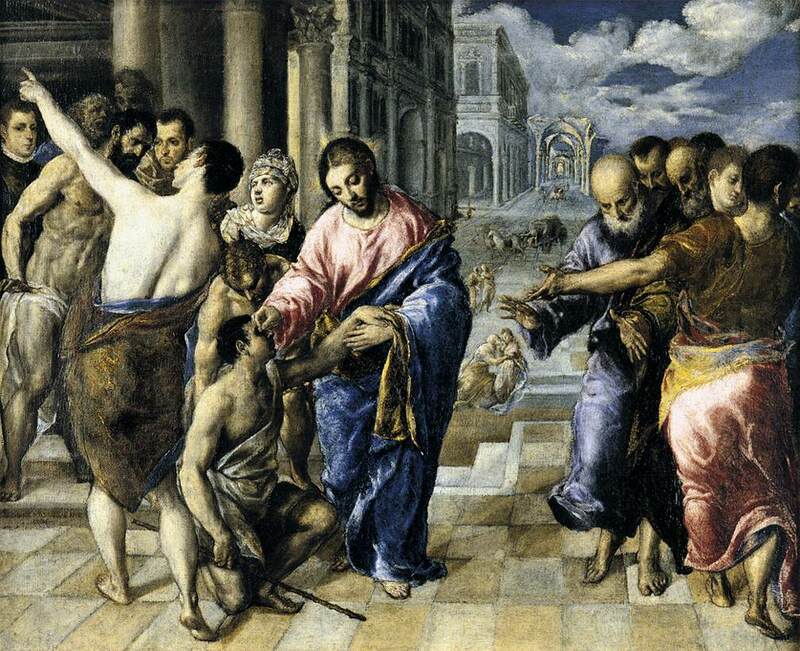 Only one sick woman is healed without asking Jesus; she touches his cloak while he has his back to her. She is the woman with the issue of blood, his gesture of faith heals her but Jesus turns round to speak to her. 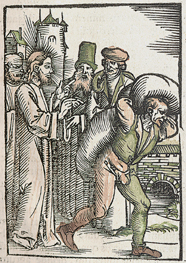 The spectators are either attentive and admiring, they are his disciples; or else they are shocked and displeased, they are learned and pious men scandalised by the words and attitudes of Jesus, He who pardons sins as if he were God or who violates the Law by not observing the Sabbath as a rest day. After this there was a feast of the Jews; and Jesus went up to Jerusalem. Now there is at Jerusalem by the sheep market a pool, which is called in Hebrew Bethesda, having five porches. In these lay a great multitude of impotent folk, of blind, lame, withered, waiting for the moving of the water. For an angel went down at a certain season into the pool, and troubled the water: whoever then stepped in first after the troubling of the water was made well of whatever disease he had. And a certain man was there, which had an infirmity thirty and eight years. When Jesus saw him lie, and knew that he had been now a long time in that case, he said to him, Do you want to be made well? The impotent man answered him, Sir, I have no man, when the water is troubled, to put me into the pool: but while I am coming, another steps down before me.Jesus said to him, Rise, take up thy bed, and walk. And immediately the man was made well, and took up his bed, and walked. In the biblical Orient, illness is generally considered as the punishment of a fault. To cleanse oneself and to expiate can lead to recovery but one can also be helped by a miracle-worker, a healer who explains the fault and gives the remedy. By healing sick people, Jesus intervenes as a thaumaturge but instead of judging the sick person as guilty he considers him/her as a victim. For the spectators, these healings are miracles, manifestations of God’s omnipotence; for Jesus, they are signs that go beyond the mere marvellous. The sick person’s faith is the main element of the healing and Jesus makes it the fundamental expression of the Good News. 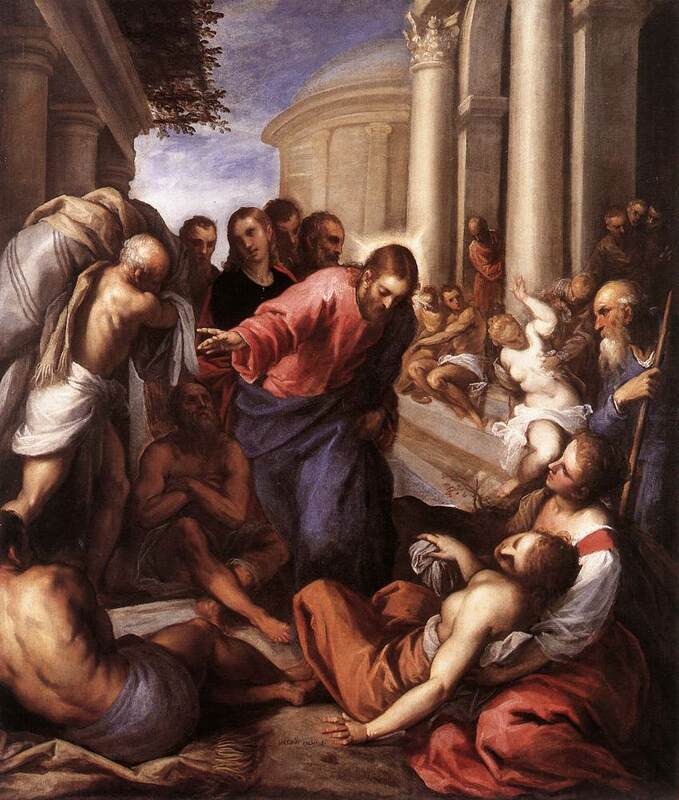 The paralytic at Capharnaum cannot get close to Jesus; he must go through the roof to be lowered on his mean bed. “Rise and walk”, then the paralytic goes away with his bed on his back. the water of the pool of Bethesda heals; it draws the crowd of sick people. In Hogarth, the paralytic who is about to be healed by Jesus’ words is placed in the centre; but in Palma, he is already healed and goes away with his bed on his back. The Pool; Giovane PALMA; 1592; oil on canvas; Collezione Molinari Pradelli, Castenaso, Italy. The Pool of Bethesda; William HOGARTH; 1736; oil on canvas; St Bartholomew’s Hospital, London. Two women whose deep faith allows their healings. The woman with an issue of blood who dared to touch Jesus’ garment without speaking to him “came trembling, and falling down before him, she declared to him before all the people for what cause she had touched him, and how she was healed immediately” (Luke 8: 47). Jesus tells her that her faith has saved her. A non-Jewish woman throws herself at his feet so that her daughter should be healed; her faith is impressive. Christ healing the Woman with the Issue of Blood; Paolo VERONESE; 1565-70; oil on canvas; Kunsthistorisches Museum, Vienna. To heal a leper by touching is to vanquish more than the disease. In the right miniature, the lepers go to have their new state registered by a priest; they are about to return to social life. According to the Gospel by John, Jesus heals a man born blind by applying a mud made of earth and saliva. The crowd is important, for Jesus explains that the disease is not a divine punishment. In the right painting, the blind man is present twice to show he is cured. Jesus opens the Eyes of a Man born Blind; DUCCIO di Buoninsegna; 1308-11; egg tempera on poplar; recto of a panel; National Gallery, London.